Give a try to Given Below Methods ! What if, all of a sudden you need to move your contacts that are available in a Microsoft Excel sheet to Outlook. Perhaps, you will try to find out the easiest way and follow it to convert excel contacts to Outlook. Right?And assume that, what if the same method starts malfunctioning rather than working in a legitimate way. Why there is need of Such Conversion? It is nearly rigorous to move N numbers of excel contacts into MS Outlook. It does not matter what methods or tutorial you are complying to do it, you will likely fail in this migration or in case if you would convert data haphazardly, it will be in an untidy form. Untidy form means the fields of contacts will be possibly distorted somehow. I have been gripped in similar kind of situation where I have to convert an excel sheet choke-full of contacts into My Boss Microsoft Outlook. Outlook in itself is a tool that is capable to do probably everything which a user typically wants to do, whether it’s opt-out data from it (in different file formats) or inserting data files from external sources. To do this sort of major tasks, Outlook provides “Import & Export” Wizard, which is developed and integrated within it by developers. 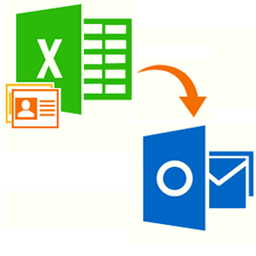 In our challenge, where we have to convert numerous contacts from an excel sheet to Outlook without putting any impact on contacts fields. Meaning, the resultant data must be in its intact form. In all honesty, my personal experience with this feature has not been good in the past and that’s why I never recommend this to others to give a try, notably when they deal with crucial data. When it comes up to your data, you are not supposed to have hiccups about any third party utility, which can become a wimp out for you. I did the same and got lucrative results using this tool. Download the tool from http://www.systoolsgroup.com/excel-to-outlook.html and install it. As you select excel sheet, software will renders all the cells of excel sheet on the software panel. Match the available contacts fields of excel with the pre-defined fields of Outlook’s contacts so that the right information (contact fields) could migrate. Sometimes, we see contacts which only posses email address and no other pertained fields. This is something, where even Import and Export function gets sapped and does not work. This tool is concerned about such contacts. Finally the conversion process is completed and the contacts are become part of your Outlook database. Open Microsoft Outlook and check it out.